How will I know if I have cancer? When will I know I am cured of cancer? When should I contact a medical caregiver about cancer? 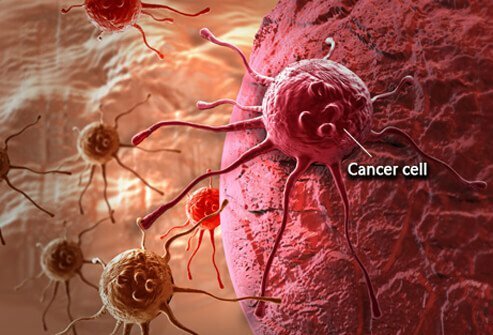 Cancer is a disease of uncontrolled multiplication of abnormal cells (malignant cells). Cancer can affect any part of the body. The abnormal growth of cells often results in a mass (tumor) of malignant cells that causes further problems by occupying space used by normal tissues. Cancers cells can also move away from (metastasize) their initial site of development to invade other tissues of the body. Cancer is not contagious. Close personal contact with a cancer patient, sexual relationships, kissing, touching, and sharing meals and/or utensils cannot cause other people to have cancer. Rarely, individuals who have received organ transplants from individuals that have cancer may also develop cancer from the transplant. However, currently a stricter screening procedure of organ donors has reduced the risk of transplants that cause cancer in organ recipients. Another very rare instance where cancer is transferred is from a pregnant mother to the fetus. A number of different viruses (human papilloma, Epstein-Barr, hepatitis B), bacteria (Helicobacter pylori) and parasites are associated with various cancers. However, although the viruses and other pathogens may be contagious or simply infectious, the cancers these organisms are associated with are not considered to be contagious. Persistent indigestion, nausea, and/or vomiting. There are various tests your physician can perform to evaluate your particular symptoms. Prevention of cancer, by avoiding its potential causes, is the simplest method. First on most clinicians and researchers list is to stop (or better, never start) smoking tobacco. Avoiding excess sunlight (by decreasing exposure or applying sunscreen) and many of the chemicals and toxins is an excellent way to avoid cancers. Cancer is not contagious. However, cancer can spread within the individual as the disease progresses. Cancer cells can disseminate from their original site and spread to other organs through blood and lymph vessels, and by direct extension of the tumor into other organs of the body. Some cancers can be cured while others cannot. A cancer that is no longer evident by physical, radiology, and laboratory evaluations after certain periods of time may be considered by the doctor to be cured. Each form and stage of cancer is different in this regard. Individuals should contact a medical caregiver if they have symptoms that make them suspect they might have cancer. Individuals who have a family history of certain types of cancer should be regularly checked by a physician. If you are a patient who has cancer, you should seek medical care immediately if you develop a high fever, shortness of breath, intense headaches, vomiting blood or passing blood rectally, chest pain or moderate to severe weakness, passing out (fainting), mental status changes, or seizures. "Is Cancer Contagious?" American Cancer Society. Jul 17, 2015. <http://www.cancer.org/cancer/cancerbasics/is-cancer-contagious>. What symptoms and/or signs prompted you to seek medical care?